Argomaniz is located at the foothills of Mount Zabalgana in northern Spain, directly west of Pamplona. This part of Spain has many beautiful nature reserves that attract thousands of tourists each year. Established in the 16th century, Argomaniz started off as a small community of 30 people, and its main source of income was agriculture as the land was easy to work and very productive. 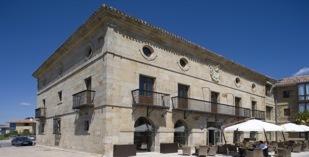 During the Peninsular Wars Napolean based himself in Argomaniz on the eve of an attack on the nearby town of Vitoria-Gasteiz and stayed at the Larrea Palace. Today this handsome renaissance building has been converted into the Parador Hotel Argomaniz retaining much of its elegant interior. It also has an excellent restaurant serving regional cuisine, and magnificent views of the plains of Alava and the Gorbea mountains. Most people come to this area to take in the mountain scenery and explore the nature reserves. Only half an hour away is the Parque Natural del Gorbeia which is a protected area that lies between Alava and the Basque country. It covers approximately 50,000 acres and takes its name from the highest peak, Gorbea, which stands almost 1,500 metres high. Some interesting sites to see while you are there is the Guiuri Waterfall, the Mairuelegorreta Caves, and the Gorbea Reservoir. All the recreational areas are very well equipped, and there are also two museums you might enjoy; the Honey Museum and the Basque Museum of Traditional Pottery. Another great spot to visit is the Ullibarri Gamboa Reservoir. It is fed by small streams that come down from the mountains and provides water and electricity to cities like Bilbao and Vitoria-Gasteiz. It is extremely popular for windsurfing, fishing, and canoeing, and it even has its own Yacht Club with a recreational area nearby that is ideal for swimming. However, if you would prefer to explore the numerous trails around the reservoir instead you can do so either on foot or on horseback. For those who wish to combine the trip with a bit of culture, only 50 minutes away is the cosmopolitan city of Bilbao where the famous Guggenheim Museum is located. Bilbao is an amazing place, with dozens of unique buildings and wonderful statues dotted throughout the city. The Plaza de Espana is a neoclassical design built during the 19th century and typical of the elegance of that period. Not only is it of architectural interest, but you can also get wonderful views of the city from here. On the Calle Esperanza is an elevator that will take you up to the Begona Basilica which is another great place to look down over the city and also gives you a great view of the hanging bridge, the Puente Colgante. Also relatively close by is the city of Pamplona which has become famous worldwide for its San Fermin festival in July. This festival is actually mentioned in one of Ernest Hemingway's novels ‘The Sun Also Rises’ and involves young men challenging themselves to run with the bulls. Hundreds of people both experienced as well as inexperienced attempt the race each year, and being such a dangerous event it has become quite a dramatic spectacle to watch, especially from the safety of a high vantage point! If nothing else you will definitely enjoy watching the sunrise in this rural part of northern Spain. Argomaniz is not only a convenient option when it comes to placing yourself within easy reach of most things but you are also able to enjoy being in a very tranquil setting. So why not consider staying at the Parador Hotel Argomaniz while you are there, for how many times in your life can you say that you stayed under the same roof as Napoleon himself?